Q: As was announced, Foreign Minister Wang Yi will attend the foreign ministers' meeting of the International Syria Support Group (ISSG) and the ministerial-level meeting on Syria of the UN Security Council in New York on December 18. What kind of proposals will Foreign Minister Wang Yi put forward during those meetings? 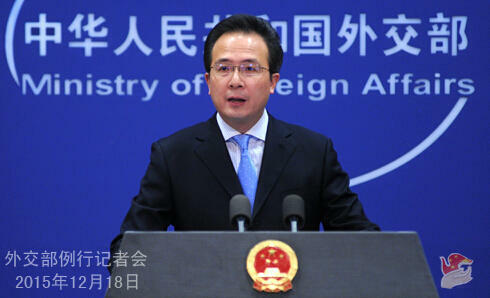 A: The Chinese side welcomes and supports the holding of the 3rd foreign ministers' meeting of the ISSG. We hope that this meeting can build on the outcomes of the previous two meetings and give a strong push to the Syrian political process. Foreign minister Wang Yi will introduce China's proposals and stances on ceasefire and cessation of violence, political reconciliation, intensified counter-terrorism efforts, post-war reconstruction, and other issues. Q: On December 17, Libyan factions signed the Libyan Political Agreement in Morocco. What is China's comment? A: The Chinese side welcomes the signing of the political agreement by Libyan factions, which represents an important step forward in the process of the Libyan political dialogue. It is hoped that all parties in Libya would remain committed to resolving disputes through dialogues so that a full-scale reconciliation can be achieved and national stability be restored at an early date. China stands for and takes an active part in the Libyan political dialogue, and supports the mediation efforts of the international community, especially the UN. China is willing to work with relevant parties and make further contributions to peace and stability of Libya and the whole region. Q: Beijing today issued another red alert for air pollution. Do you have anything to say about China's environment and the measures that the government is taking to cope with it? A: The Chinese government has been working hard to improve the environment. We have laid down major policies, taken a range of actions, and made positive efforts to that end. When it comes to managing the environment, we still face multiple challenges, but we will stay steadfast to our goal, as it meets the common aspiration of the Chinese people.